Risk managers and safety leaders know that in order to keep an organization safe, we have to make progress with the reduction of risk. Through the application of a safety management framework (think Z10 or 18001/45001), health and safety risks are examined and quantified throughout the organization. This gives us a picture of the risks that we’re still exposed to, regardless of what that TRIR is telling us. Zero injuries is “good,” but not great. In most organizations, safety leaders are familiar with the concept of return on investment. For those that aren’t, ROI is considered in situations where the organization allocates resources (money) to achieve an objective (e.g. sales, infrastructure, processes, etc.). The organization wants the highest ROI it can achieve. Approached from a ROI perspective, the safety management system quickly turns safety from a cost center into a profit center. How’s this? By applying a dollar cost of risk metric to our safety management system’s key performance indicators. The reduction of risk can be tracked (per dollar) through the safety management system, and those risk reductions can be quantified by a metrics gauging the return. By examining all of the organization’s work processes like this, it gives the safety leader a tangible way to justify investment for his/her organization in safety. It also provides a method of systematically, and objectively, reducing risk in the organization starting with the most severe risks (think higher ROI) first. This represents the transition from “good” safety performance to “great” safety performance. There will certainly be some safety-related processes in your organization that it simply won’t pay to improve. By taking a systematic and quantifiable approach you’ll be able to have better, and more intelligent conversations with other decision-makers on where your organization’s resources are better invested, and have a justifiable reason(s) for not having improved a control or process. Collins, J. (2001). 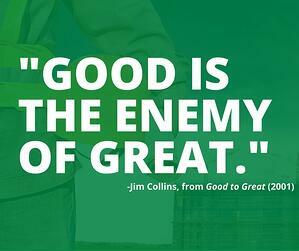 Good to Great. New York: HarperCollins. ISBN 0-06-662099-6.